The National Productivity Day is observed on 12th February every year in India, and National Productivity Week from 12th to 18th February. The National Productivity Council (NPC) is celebrating its 60th anniversary as Diamond Jubilee Year. 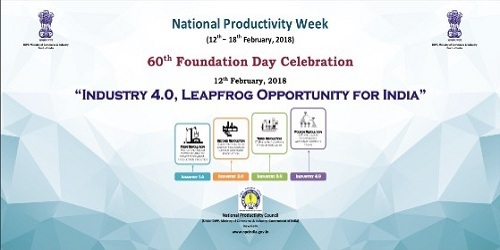 The NPC has selected the theme ‘Industry 4.0 Leapfrog Opportunity for India’ to mark the National Productivity Week -2018 (12th Feb – 18th Feb). The National Productivity Day is organised by NPC, in order to encourage and integrate all stakeholders in the implementation of productivity tools and technique in raising production standards. Industry 4.0 or the 'Fourth Industrial Revolution' is observed arising worldwide fiercely and is being termed as the next industrial revolution. Industry 4.0 is distinguished by the enhancing digitization and interconnection of products, value chains and business models. Industry 4.0 indicates the encounter of real and virtual worlds, as the next phase in bringing together conventional and modern technologies in manufacturing. Industry 4.0 is believed to result in the ‘Smart Factory’ which is characterized by versatility, resource efficiency, ergonomic design and direct integration with business partners. NPC is a national level autonomous organisation under Department of Industrial Policy & Promotion (DIPP), Ministry of Commerce & Industry to promote productivity culture in India. NPC was established on 12th February 1958, to boost and promote productivity and quality awareness across all the sectors in India.